Richard Sherlock is back on the case when his attractive, blonde assistant, Tiffany Richmond, takes a sip of a loaded cocktail putting her life into a complete tailspin. This sets off a chain reaction of twists, turns, and troubles, which only Sherlock, can untangle. Along the way, Sherlock discovers dirty money being laundered, drug deals going down, shots fired, an exploding club scene, and a kidnapping, where Sherlock is forced to go to McDonald’s for lunch. 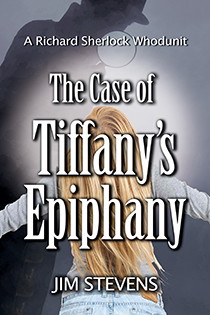 Add in a dead bartender, buffed bodybuilders, body-buddy bouncers, a Behemoth, a very bad basketball team, and Tiffany’s tipsy torment, and Sherlock not only has to figure out whodunit, but why they did it. “This P. I. novel is very delightful. There’s nothing risqué, and there’s plenty of action. Most enjoyable is the author’s literacy and use of allusions. A highly pleasurable read.